Quick-access hatch - lets you access contents without letting the cold air escape. Will hold up to 185 cans. Holds 2 liter bottles upright. Keeps ice cold for up to 5 days! Threaded drain plug for hose hook up. Great for Outdoors, Sports & Events, Tailgating, Parties & Patio, Hunting, Boating & Fishing. Measures 38"l x 18"h x 18"w. Weight 19 pounds. 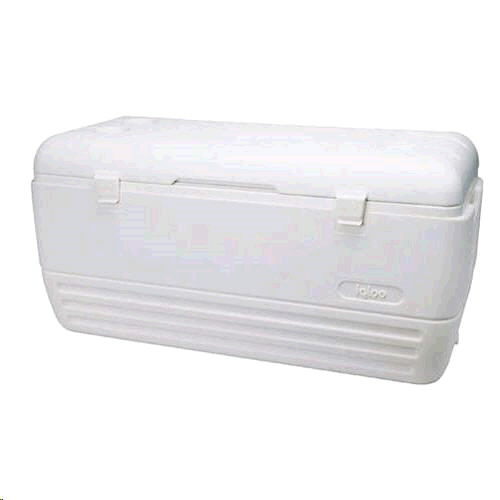 * Please call us for any questions on our cooler igloo chest 120 qt rentals in Pipersville PA, Hatfield PA, and Bucks & Montgomery Counties in Pennsylvania.